We are starting another new edition this week and it's already BM#42. We are on the seven month of this year and in BM group we are almost progressing towards to the ninth month, looking forward for the BM # 44 International ABC Cooking. When I pause over it, I feel bad that we are hurrying up through the days, not even lingering a moment to enjoy the day. Anyway I am sure all of us enjoy the journey as well.. Coming to this week's theme, I opted to do Easy Tiffin. The idea was to arrive at simple, quick tiffins that can be served to kids when they get back home after school. I was hoping this might be easy for me to decide. Needless to say, it was so hard for me to meet the conditions of at least getting approval from two of them. 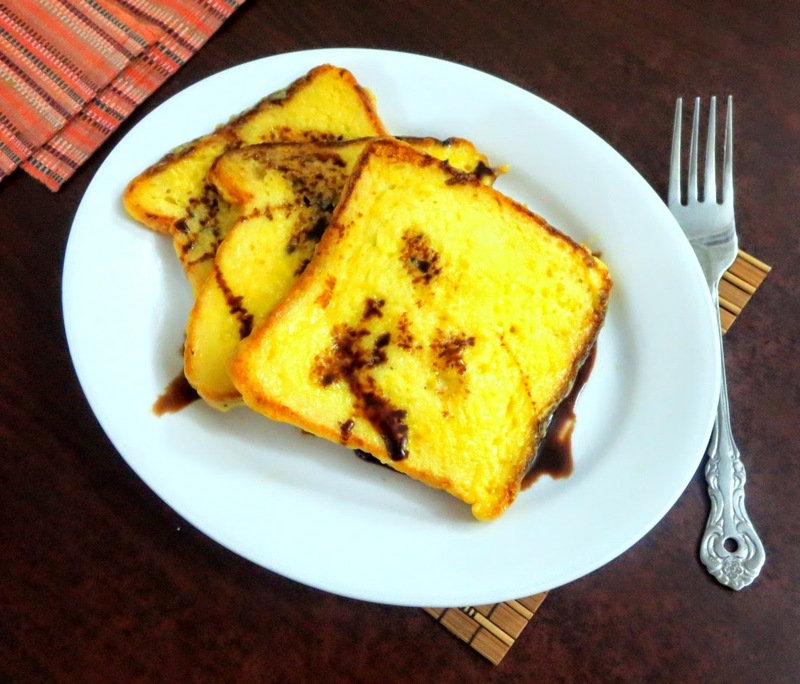 I ended up making these Eggless French Toast from Sapana and both Konda, Peddu loved it so much. Chinnu doesn't eat bread, so it was impossible to get him to even taste. However the other two loved it so much that I had to make it again for their breakfast the next day. Peddu even wanted me to pack it for his Snacks. So you can imagine the popularity this quick dish seem to have got so quickly. Making this is very easy, except for the sticky pan you will end up having to clean. 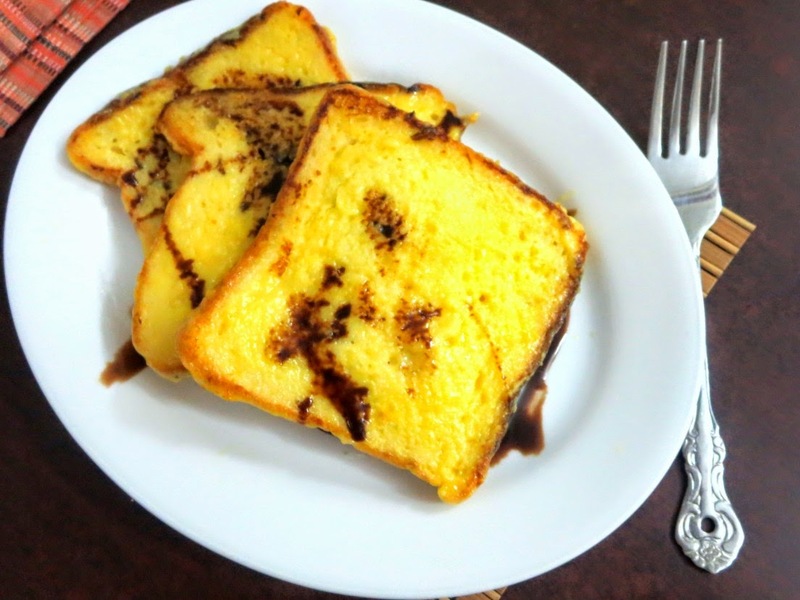 While I was making it again the next day, Konda was telling me how she liked it and also why this was called French Toast. I told her about the French Toast, that used to be my favorite as a kid. Hearing that she was curious to taste that and wanted me to make it for her. So one of these days I might make it for her. 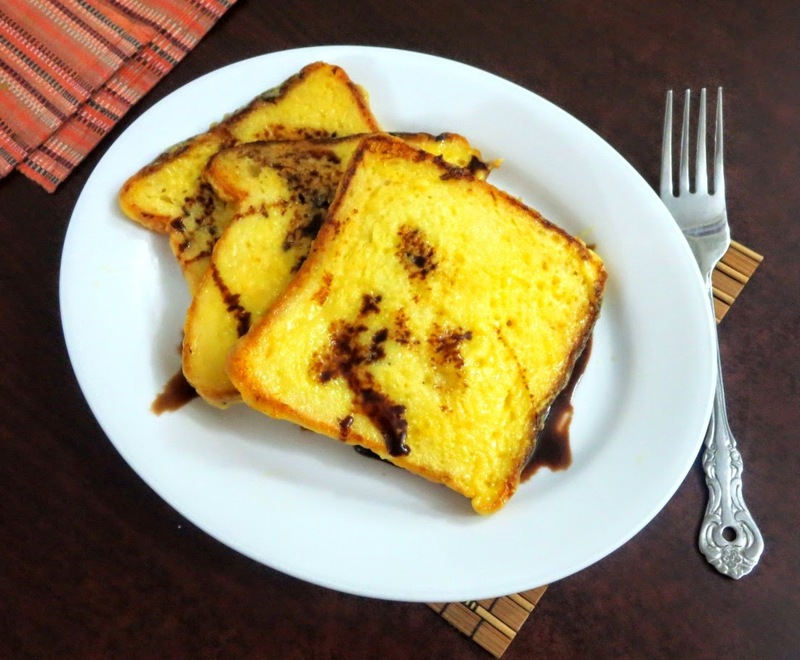 Until then, it is going to be Eggless French Toast. 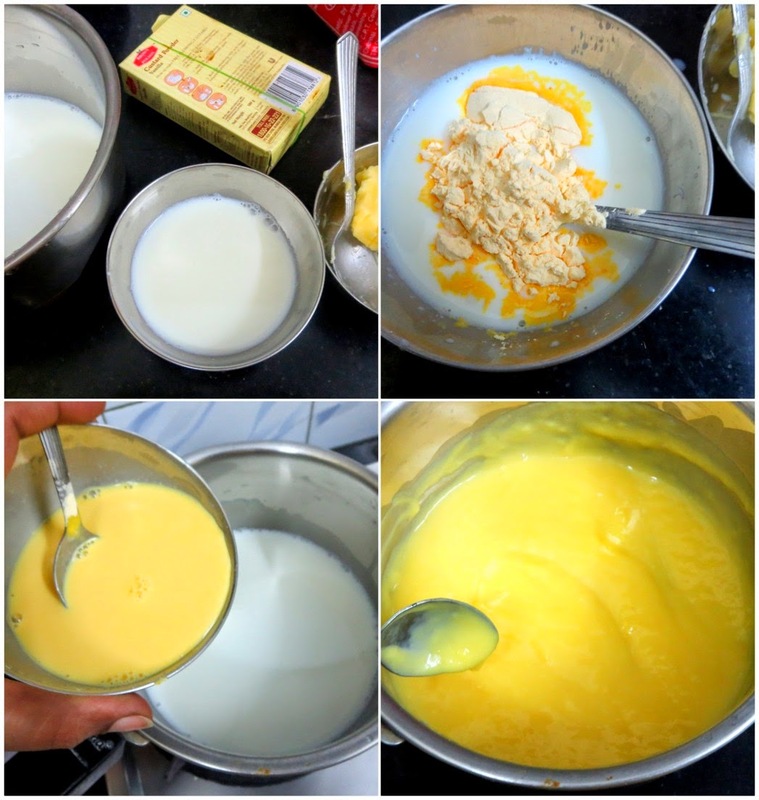 In a bowl mix the custard powder with little milk to form a lump less paste. Heat the remaining milk with sugar and add this paste and quickly stir well. Make sure it's lump less. Cook till it becomes thick. Remove and keep it aside. Heat a non stick an or tawa, spread butter over it. Dip the bread slice on both the sides and cook on the tawa. Let it toasted well and then flip it to other side and cook . If you are expected a browned expect this doesn't happen. It will have a nice buttery aroma and texture. The bread becomes soft and soggy over a period. Unless you cook for longer period. I tried making a design with chocolate sauce, it flopped and I sort of salvaged the results. It tastes great with chocolate, however.